This is a Flickr badge showing public photos and videos from homebodylynn. Make your own badge here. M.E. 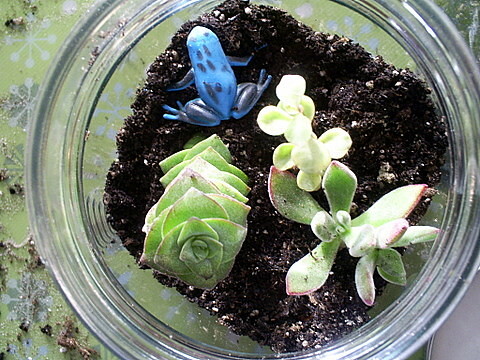 's succulent terrarium for Grandma, originally uploaded by homebodylynn. M.E. had a friend over Saturday and they made terrariums. M.'s was for her Grandmother. Bee told me he remembers his mom making them when he was a kid. She's great with plants. Any little plant we've ever given her flourishes under her care. I, on the other hand, can't even keep a cactus alive. Those succulents must be have been relieved to be leave my house. Grandma also got her favorite candy, chocolate covered cherries. My mom got the same thing I got for her last year, a gift certificate for eBay. Over the years I've knit and fulled her a purse, embroidered her a felt checkbook cover, wet felted her a cell phone cozy, woven her a scarf and sent her flowers, but the present I think she's liked the most is the eBay gift certificate. I don't blame her. It's eBay. Bee and I have decided we don't want gifts for Mother's and Father's Day anymore. We have Christmas and then Lee's birthday in February, M.'s in March, mine in April and Bee's in May (he's 45 tomorrow)! That's all the gifts we can handle. So for Mother's Day they made me breakfast and gave me a funny card and then Bee and the kids went off to church while I got the day to myself. After church M. would go to Grandma's and Lee to practice with his band and Bee would come home so I figured I'd spend the day painting my desk, reading and generally putzing around the house and even have some nice time alone with Bee. What I didn't plan on was a migraine and poison ivy all down the left side of my face. It sucked. At least now I can say I've found migraines to be good for something- they make you forget how much your poison ivy rash itches. In case you're interested, the best way I've found to stop the itching so far is to put very hot water on the rash. I get it as hot as I can stand it and keep it on until the itching stops. After that I put on Caladryl and I'm good to go for awhile. I found this site has a lot of good advice for poison ivy victims. I hope you never need it. Trying out this brew tonight. He's not Petey, but he needed a home.